Website and processes: 7 Jan 16 Cheryl, 5/5 Excellent "Had been thinking of something along these lines for my brothers 60th birthday. He was an ATC cadet for several years & this will be special to him. Found this website, found exactly what I'd been imagining, and the whole thing was quickly and easily done. Will definitely look here again for special ..."
We recommend that you wear long sleeves and trousers and should avoid wearing a hat (helicopter downwash can be quite exciting!) The pilot can control the internal temperature of the helicopter, although it can become quite warm on sunny days. 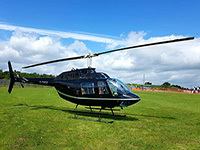 The helicopters carry between 3 and 6 people, so there will be other passengers on board. Flights typically take place at weekends between February and November except Scotland where we operate all year round. Locations may be subject to change. Additional locations may be available during the year. Note:Flights from Newquay ONLY available during the Boardmasters festival 9th-11th August 2013. Note:St Ives flights available 5th-8th August 2013 ONLY. Dunkeswell has limited dates throughout the year. Woolsington, Tyne and Wear, NE13 8BT. The voucher will have Newcastle printed on it, but it can be used from..